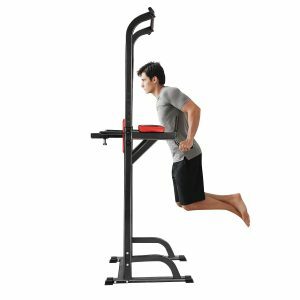 Jaketen Full Body Power Tower is basically a solid pull up stand with additional functions, that lets you do a variety of strength training exercises. It has a tough and sturdy steel frame that can have up to a decent 350 lb. user weight. And there won’t be any shaking or wobbling when you’re exercising on the unit, with its robust base that includes no-slip end caps. The handles are anti-slip and feel comfortable throughout your workout. It is solid and durable- is designed to last a long time even if you are on it every day. You can also install it on pretty much any surface. And it will feel comfortable with the sponge padded cushions that are covered with the imitation leather on the arms and the back. The height of the power tower is conveniently adjustable to four levels- 64.6, 71.3, 77.9 and 84.7 inches. So you have the pull up station, with push up, chin-up and dip stations, arms support and single parallel bars. And you can work on your core section- abs, arms- triceps and biceps, shoulders, chest, back and legs. You can see the parts you will receive in one of the photos and it is quite straightforward to put together. You will get a reasonable tool kit and easy to read- clear instructions. At first the exercises that you can do on this power tower can look a little intimidating and hard for an absolute beginner. But they can mostly be changed and made easier. You just need to look for the videos on the internet, especially Youtube to see what is available for you. You can start out with the easier modified versions and then move on to the proper full forms when you feel you’re ready. It is important that you stick with your exercise plan, use this regularly and eat healthy to achieve the results you want quicker. This is mostly good for resistance training type of workout using your body weight, plus adding some extra weights to make it more challenging. But it will also help you with burning calories and fat and losing weight purposes too. We all have different levels of strength and will be different on different days too. It is easy to assemble, feels solid and stable once set-up, has a very sturdy construction and a 350 lb. weight capacity, is adjustable for height for people at different heights and very versatile to let you work different parts of your body. And with the current discount on Amazon.com you’re actually getting pretty good value for money. It is not suitable for commercial gym use as it would be used by tens of people each day in a gym setting. But it is perfect for use in your home gym, by you and the people in your house.